touristplacesinindia offers complete information on Tourism in Mangalore, Mangalore Tourism, Travel to Mangalore, Hotels in Mangalore, Mangalore Hotels, Mangalore Travel, Mangalore Tour Packages, Visit Mangalore. Mangalore is an important port city located on the west coast of India in Karnataka, one of the major South Indian states. Mangalore has served as an important port in ancient India, and references to this old city can be found from records of 8th century. Tourism in Mangalore is an important contributor to the overall economy of the region, which is predominantly dependent on many large industries and port related occupations. The history of Mangalore, as mentioned above, goes back to the 8th century AD. The city and the surrounding region eventually came under the authority of a long list of rulers, including the Portuguese and Tipu Sultan. The 4th Anglo-Mysore war was won by the British and after Tipu’s death in this struggle, Mangalore came under British authority till Indian independence. Mangalore has also found mention in the memoirs of medieval foreign travelers like Ibn Batuta. The city was part of the Madras Presidency under the British. After independence, Mangalore was made a part of the Mysore state, until the reorganization of the states. The chief economic activities in Mangalore are the heavy industries, which include the automobile leaf spring industry. Petrochemicals, iron-ore and fertilizers are some of the other industries that are thriving here. In recent times, the information technology industry has made inroads in the city, and many outsourcing firms have started operations here. Agricultural processing is another major industry. Export in coffee and cashew is another important economic activity here. The beaches and the temples top the list of tourist attractions in Mangalore. The beaches of Mangalore are wonderful tourist destinations, offering contrasting experiences of peaceful relaxation as well as many fun activities, apart from a wide range of local food. 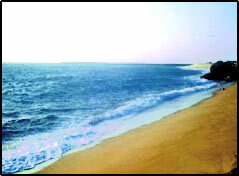 Someshwara beach, Panambur beach, Mukka beach and Tannirbavi beach are the major beaches of Mangalore. The major tourist attractions in Mangalore include famous temples like the Mangaladevi temple which has given this town its name, a lighthouse, and the Seemanthini Bai Bejai Museum, apart from some beautiful churches and mosques. Adding to the beauty of this serene town is the general ambience. The famous tiles of Mangalore made of local hard clay adorn most of the houses. Coconut palms line the roads all over the town and its surroundings. The temperature is moderate, staying between 27 to 34 degrees. December to February is the best time to visit Mangalore. The region receives a great deal of rainfall between May and October. Humidity is to be expected all year around, especially in summer. Touristplacesinindia.com offers all inclusive online information about Mangalore and other important tourist places in India.